So it’s been a while since I’ve posted anything on my brother’s blog. I decided that my first post back on would be about a musical I have been obsessed with for the past month. I am a bit late to fall in love with the show because it’s been out since the beginning of last year. Nonetheless, I am so in love with the musical. Someone had uploaded acts 1 and 2 online (recently taken down) and I was lucky enough to watch it in time. I find myself trying to learn the lyrics and learning the raps for all the songs. The way Lin-Manuel makes King George III the comic relief with the British-pop interludes is probably one of my favorite moments in the musical. It’s about Alexander Hamilton, one of the founding fathers of the United States and first Secretary of Treasury. It’s a 2 and a half hour hip-hop musical that goes though Hamilton’s life from when he was 19-years-old up until his death which was a dual with Vice President Aaron Burr. Today on July 7th, 2015 my idol, the person I look up to the most came out as bisexual. Shane mentions in his video that he was struggling with his sexuality all his life. I am so proud of him and doing such a scary thing, coming out to over 6,000,000 subscribers. This is just a reminder that Bisexuality, Pansexuality, Demisexuality, Asexuality, and all genders and all sexualities ARE real. No one is confused. There is a YouTube channel that I currently obsessed with. They’re called Postmodern Jukebox and they take popular modern songs and cover them in different eras! This one is one of my favorites, especially their “Tambourine Guy” (Tim Kubart). His enthusiasm brings me life! “First of all, you are missing the point you overly-privileged-white-man. Second of all, the women who hate men are called Misandrists (misandry is the hatred of men). Feminism has no relation of that [anymore]. Don’t go off on an unrelated tangent about Nazis and [the KKK], those were horrible things in history that shouldn’t be compared to something that is for women’s rights. Feminism fought for the right to vote, Feminism fought for women to get actual jobs, Feminism fought for women to join the Military, hell, Feminism fought for women to work in Congress and other Governmental jobs. Now we have a woman running for Office. I feel proud for getting the last word. I haven’t posted in a couple months, wow! I’ve been busy with college and studying for my mid-term. Well, now with my mid-term over I can post more! 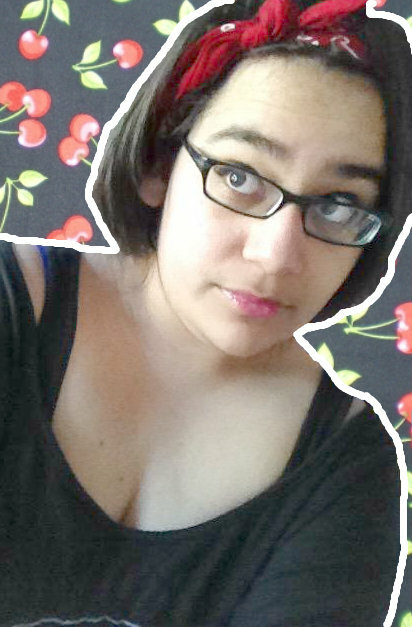 Sadly, I don’t have any idea of what to write so here is an edit I can of myself with my new bandanna. I feel the rockabilly running through my veins! Hello! Long time no post. I want to post something that has been on my mind for a while now. So there is a new (and horrible) trend called “Meninists”. Basically, they are completely opposite to feminists in every way. 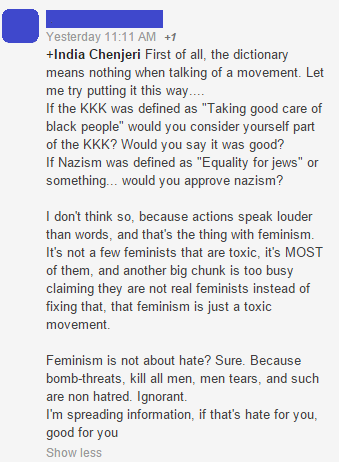 On my Tumblr ( http://fam0us-last-words.tumblr.com/ ) there has been a user who is defending meninism. I understand not everyone will have the same point of view as me, but I feel like it’s my right as a person to express my views. First off, I don’t know the user who has been sending me their defense, but I can tell you their points are weak. They say “I personally have no problem with feminism and wanting equality…”. I was thinking “Rad, good.” Then they continue with, “…but meninists want to keep their control and power too, that’s true equality!” Um, no. Feminism literally means – “the advocacy of women’s rights on the grounds of political, social, and economic equality to men.” However, there are feminist extremists out there, I agree. I am not an extremist myself, I’m just passionate about this movement. The user arguing with me thinks I’m an extremist simply because I used the phrase,” As a feminist, I want our society to stop viewing women as just a fashion accessory or a sexual object on a movie screen”. I also want to just point out, if these so-called “meninists” act so confident with themselves, they wouldn’t be calling themselves a meninist at all. Also, a woman didn’t slave hours into the night or hours into the morning to give birth to someone who disrespects other women. Sigh… Sometimes I feel as if I’m an extremist, but other times I know I’m not because I just want everyone to be equal and be treated like humans and not everything being a contest. Welp, that’s it. That’s my late night rant about feminism. So, Jason and I went to Warped Tour 2014 on June 29th! It was so much fun, besides the overpriced food and sun burns. These were some of the bands we saw and I’m proud to say I got Jason into Motionless in White. I almost met YouTuber Deefizzy, Vincent Cyr, and Bryan Stars, but apparently you neeDED A STUPID RED PASS TO MEET THEM! Other than that, it was a blast!